Johann Georg (George) Hahn was born August 20, 1858 in Norka, Russia, the son of Adam Hahn (born 1809) and Amalia Hölzer (born 1815). George was baptized and confirmed (in 1873) by Rev. Christoph Heinrich Bonwetsch. He attended the Norka church school and was known as a talented and industrious scholar. George served in the Russian army. He excelled at his training school where he learned higher levels of arithmetic and writing skills which would serve him well in his chosen occupation. George married the widow Catharina Sophia Müller (Sophie Miller) on January 29, 1885 in Norka. Sophie was born in Norka on July 2, 1862 and was confirmed there in 1877. She was the daughter of Johann Peter Müller (born April 7, 1839) and Elisabeth Hefeneider (born February 25, 1840). A son, Georg Heinrich Adam (George), was born to George and Sophie on October 3, 1885 in Norka. In the spring of 1886, the Hahn family set out for America. They sailed from Hamburg, Germany aboard the steamship Hammonia and arrived In New York on August 13, 1886. The Hahn's first settled in Sutton, Nebraska and later settled in Hastings, Nebraska. Three children were born in Hastings: Johann Ludwig (born February 5, 1887), Elisabeth (born November 20, 1888) and Heinrich (born June 30, 1890). 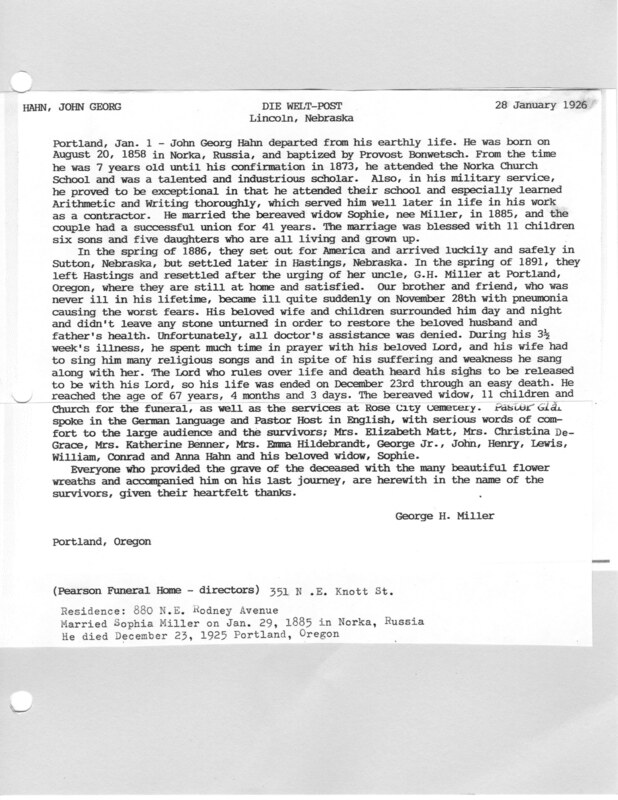 In the spring of 1891, the family departed Hastings and resettled in Portland at the urging of Sophie's uncle, George H. Miller who had settled there around 1890. Seven children were born in Portland: Christina (born January 26, 1892), Katherine (born November 28, 1893), Anna Maria (born January 1896), Ludwig (also known as Lewis, born March 13, 1898), William (born January 18, 1900), Conrad (born December 18, 1901), Anna (born September 11, 1907) and Emma (born about 1905). The Hahn's became members of the Ebenezer German Congregational Church on February 25, 1895. The family resided at 335 Beech Street in 1900 and George worked as a hod (brick) carrier. By 1910, the family had moved to 800 NE 11th Avenue (at the intersection with Failing Street) and George worked as a plasterer. Maria Hahn, a daughter of George's brother Heinrich, also settled in the Portland area. She married Peter Schreiber. By the mid 1920's the family resided at 880 NE Rodney Avenue. George had become a successful contractor in the Portland area. On November 28, 1925, George became ill with pneumonia. His family stayed with him day and night and Sophie sang religious songs with him until his death on December 23, 1925. A funeral service was held at the Ebenezer German Congregational Church. Pastor Graf spoke in German and Pastor Yost spoke in English. Johann George Hahn then made the journey to his final resting place at the Rose City Cemetery. Sophie lived for many more years. She passed away on August 2, 1942 and was also buried at the Rose City Cemetery. Miller, George H., "Obituary for John Georg Hahn," Die Welt-Post, Lincoln Nebraska, January 28, 1926. Contributed by Nancy Myers, a great-granddaughter of George and Sophie Hahn. Krieger, Joanne, trans. Ebenezer Congregational Church, Portland, Oregon 1892-1908. Portland, OR: n.p., 1999. 30. Print.